With trying to eat as organically as possible, it's great to know there are some brands like Santa Cruz that have always been organic. Santa Cruz products have been organic since 1972! They must really know what they are doing, and it shows in the awesome selection of juices. Recently, we had the opportunity to try some! Soak up the sunshine & sip something sensational! 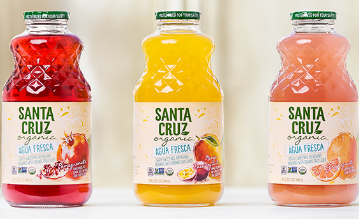 Try one of Santa Cruz's delicious summer beverages from lightly sweetened Agua Frescas to carbonated tea lemonades. 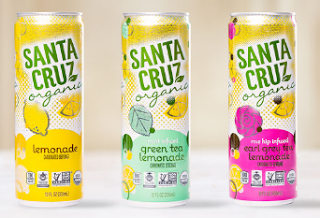 The latest addition to the Santa Cruz Organic® family, our Carbonated Tea Lemonade and Carbonated Lemonade Beverages make it fun to Keep on Cruzin’ through the warm summer months. In addition to being made with Fair Trade Certified tea and cane sugar, our Carbonated Lemonade Beverages are Certified USDA Organic, Non-GMO Project® Verified and available in three uniquely refreshing flavors—Green Tea Lemonade, Lemonade and Earl Grey Tea Lemonade. So pop open a can and enjoy the tantalizingly taste that’s sure to become your favorite sip of the season. Our Santa Cruz Organic® Lemonades have long been a favorite summertime treat. Try our Cherry, Peach, Mango, Raspberry, Strawberry, and Original Lemonade beverages today! Like all Santa Cruz Organic products, Santa Cruz Organic® Lemonades are certified organic in accordance with the United States Department of Agriculture's organic regulations. Bearing the official USDA Organic seal, Santa Cruz Organic® Lemonades are guaranteed to be organic, from the ingredients through the recipe-batching process, and into the bottle. This assures product integrity and supports efforts for environmental responsibility. 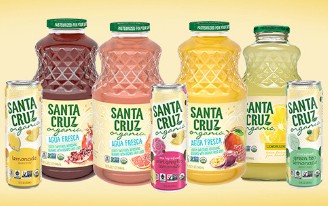 School is almost back in session send your kids back being refreshed with these and other great Santa Cruz products. You can find these products and more from Santa Cruz in your local grocery store.